It’s almost there: the day that is supposed to be the most depressive one of the year. Blue Monday is of course commercial nonsense, but it’s true that January can be a rather dark and somewhat gloomy month. While for most people, any dull day is quickly replaced by brighter days, for some people all days can be like Blue Monday. They might suffer from a depression, something that can actually happen to anyone, including the most talented, creative, and productive people. A depression can sometimes make one’s life feel as being unbearable, in a way that help from others is needed to keep going. Unfortunately, we won’t see DJ Avicii and Kurt Cobain perform on the stage anymore. Join us to sit out Blue Monday (January 21st) in Groninger Forum to watch the movie ‘Control’, which tells the success story of the band Joy Division, the ups and downs of their eccentric lead singer Ian Curtis, and the sad and intense end of his life. The movie will be introduced by Robert Schoevers, Professor of Psychiatry at the UMCG and specialized in depression. The evening will end with a short discussion by members of 113 suicide prevention. Apart from the impressive movie, you will be brought up-to-date about the latest knowledge on the risk factors of depression, burn-out, and suicidality. You will learn how to pick up early warning signals and what you could do to help someone who’s sending out such distress signals. This ‘blue movie’ will be the kick-off of a series of public outreach events initiated by BCN BRAIN UMCG and the University of Groningen titled “Marvelous Mind” (www.RUG.nl/marvelousmind), following the example of a similar initiative in Amsterdam, called “Brein in beeld” (www.breininbeeld.org). Neuroscientists will share and discuss knowledge about how the human brain works, various brain diseases and how to handle them. Future events will be organized on a monthly basis, consisting of movies or debates, for instance about sexuality, prevention and treatment of dementia, dealing with autism, or the use of animals in brain research. 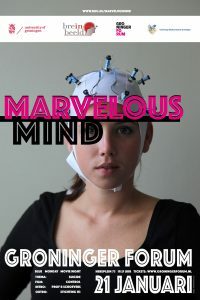 You can subscribe to receive our updates of events by sending an e-mail to marvelousmind@rug.nl.